The Brisbane Meditation Group is part of Self-Realization Fellowship, a worldwide non-profit organization with international headquarters in Los Angeles, California. Paramahansa Yogananda founded Self-Realization Fellowship in 1920 to disseminate definite scientific techniques of meditation. 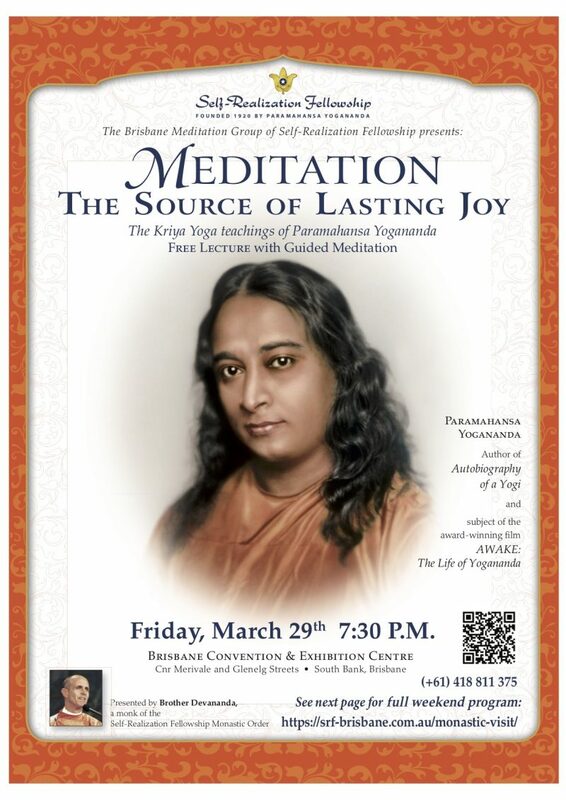 Paramahansa Yogananda said the advanced meditation techniques, Kriya Yoga, Hong-Sau and Aum, taught by SRF, will enable one to awaken the mind’s unlimited power and to experience peace, love and ever deepening awareness of the Divine. The universal teachings of Paramahansa Yogananda offer a science of spiritual exploration, one that enables us to create for ourselves spiritually harmonious lives, and to contribute to a more compassionate and peaceful world.